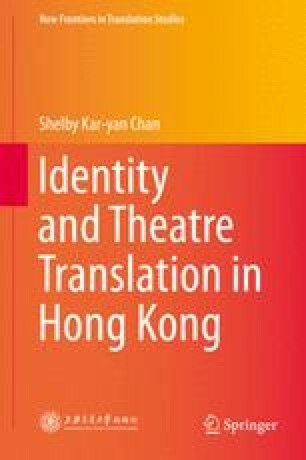 This chapter deals with the China/West dilemma of Hongkongers through the study of theatre translations of Hamlet in Hong Kong, with a particular focus on Richard Ho’s 1979 version. The preliminary proposition is that the resulting Hongkongness is a unique adaptation of a cultural Britain to a cultural China, whereby the cultural includes the historical but shies away from the political, economic or geographical adaptation. Quotations from Hamlet are taken from Hamlet (The Arden Shakespeare), ed. Harold Jenkins (London and New York: Methuen, 1982). Quotations from Hamlet: Sword of Vengeance come from Wangzi fuchou ji 王子復仇記, trans. (with introduction) Richard Ho (Hong Kong: Xuejin chubanshe, 1979). All back translations from Chinese to English are done by the writer, unless otherwise stated.